Sample Babywise Schedules. Babywise schedule for the fourth month. 3 month old Babywise sleep schedule. 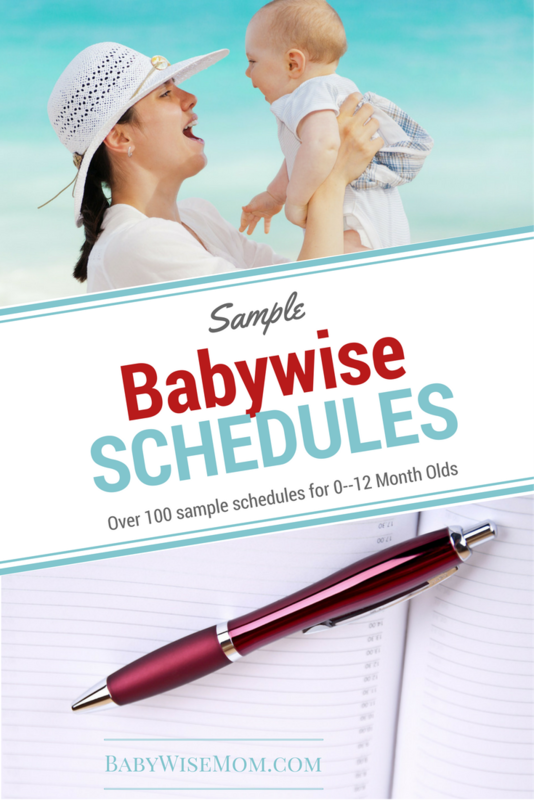 See what schedule other Babywise babies followed. Your baby’s fourth month is her month as she turns three months old. The first month, 0 months old, was the first few weeks of life. The forth month is her month as a three month old. This is your first month stepping out of the newborn months! 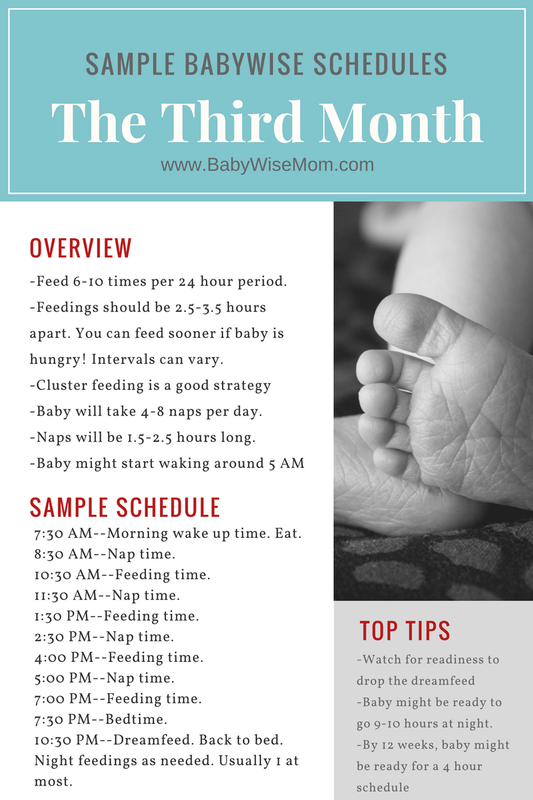 Now that you have a three month old, read through my sleep hierarchy for 3-6 month olds. The goals and ideals change a bit with this older age range. 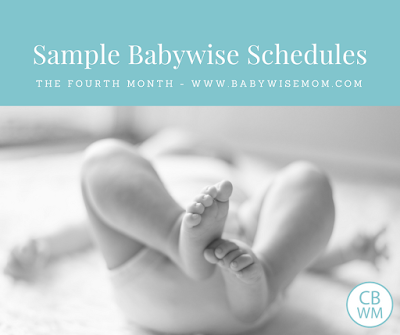 Here are some sample Babywise schedules for you to use this month. This post contains affiliate links. 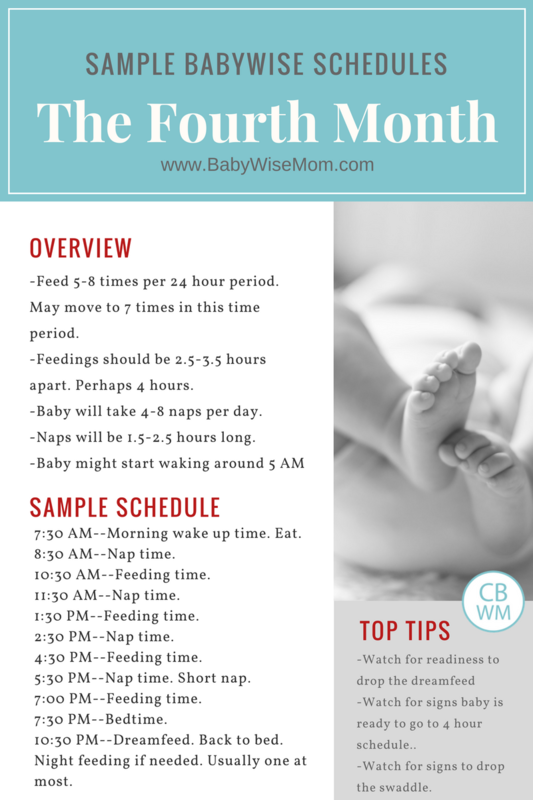 12 weeks: 5-8 feedings per each 24 hour period. 12 weeks: Feedings will be 2.5-3.5 hours apart. 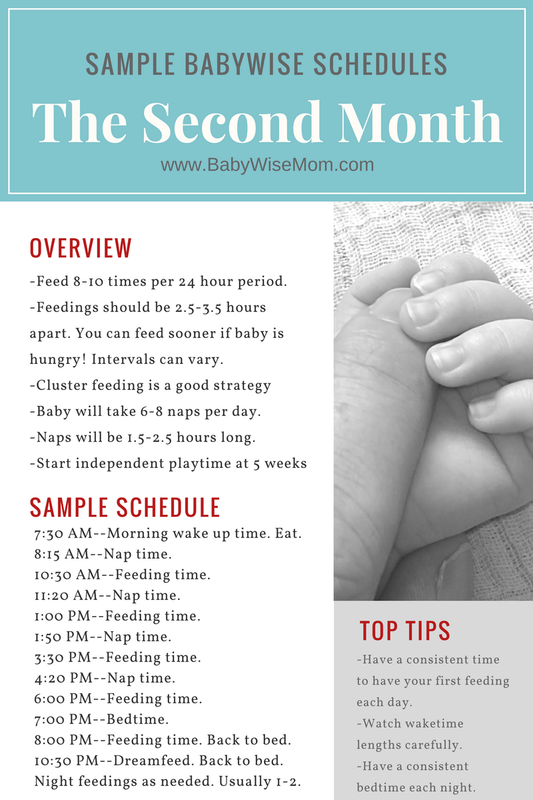 12 weeks: Some babies might be ready for feedings to be spaced 4 hours apart. Watch for that this month. 12 weeks: Your baby should take 4-8 naps a day. 12 weeks; Naps should be 1.5-2.5 hours long. The exception is your final nap of the day. This might be 30-60 minutes long. Your baby will likely be sleeping anywhere from 7-10 hours at night. If you drop the dreamfeed, baby might sleep 12 hours at night. Watch for signs your baby is ready to drop the dreamfeed. Not all babies are, but some will be ready during this month. If you are breastfeeding, consider pumping at a dreamfeed if your baby stops eating at the dreamfeed. This will help keep milk supply up. Watch for signs your baby is ready to stop being swaddled. Some swaddle beyond this age, but some are ready to stop as a three month old. Babies in this age range will start to talk to themselves around 5 AM. If left alone, they will typically go back to sleep. This is just something they do developmentally. There is a significant Wonder Week around 12 weeks old. Here are our schedules we used in this age range. At this age, her night feeding was in those early morning hours, usually around 6 AM. I believe she dropped that feeding around 4 months. 6:30 PM–sometimes woke. She is starting to usually take a shorter nap at this time of day. If she woke at 6:30, I got her and held her until starting to feed her at 7:00 PM. If she didn’t wake at 6:30, I got her up at 7:00 to eat. 7:00 PM–eat then right back to bed. It is a bit different this week since she is extending nights. I will just say she is waking at seven even though it ranged from 6:45-7:15. 7:00 is a happy medium. I also work very early, so I have to leave the house by 6:30 am and get home at 5. So I always want to make sure she starts the day with a breastfeeding before getting breastmilk from a bottle all day. 8pm-feeding,and goes to bed at 8:30pm,50% of the feedings i wake him up,specially on this one. 2am-feeding,he wakes up for this one. I’m still working on getting him to STTN, the longest interval so far is 6.5 hours but that is about it. and i usually pump before going to sleep(10-11pm) to keep my milk supply. He sometimes awakes by the 45 minute intruder during 2nd and 3rd nap but if I go in right away and give paci he goes right back to sleep and finishes out nap… he started sttn at 7 weeks! We just moved to this schedule about 4 days ago after weeks of battling the 45-minute intruder and thinking he needed less awake time. I finally went with my gut that he was undertired and so allowed more awake time (almost 2 hours sometimes! ), dropped the dreamfeed, and moved to a 3.5 hour schedule during the day. It has worked like a charm so far–he sleeps 1.5-1.75 hours each nap, 10-11 hours at night, and is happy and alert during awake times! He also still averages 15-15.5 hours of sleep a day, so it seems like enough. And he is not overly sensitive about the exact amount of wake time. We just watch for yawns, stillness, or sometimes fussiness before putting him down. Wake time–independent play in gym, some play with mom and dad. 10:30am Wake, nurse both sides. Wake time – tummy time, reading, playing in gym, playing with mommy, etc. Into pjs, read a book, sing a lullaby, and into bed by 8pm. No dreamfeed since 13 1/2 weeks. No MOTN feed since 8-9 weeks. 9:30pm Pump right before going to bed. I started doing this when he dropped the dreamfeed, since he’s still pretty young and I don’t want to compromise my supply. Not sure how long I’ll continue. He was going so long at night I started to pump twice a day to make sure my supply didn’t drop. I typically can freeze 6oz but it can range up to 12oz. He moved to a 4 hour schedule at 2 months. 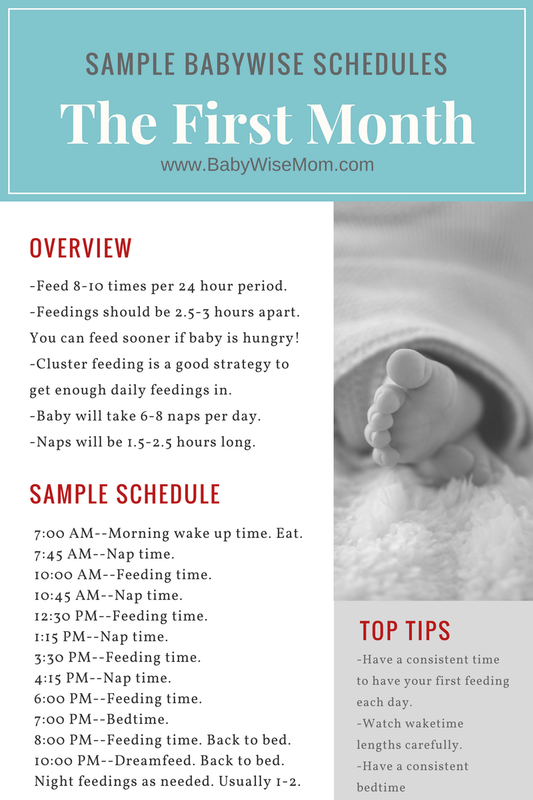 Start time and bedtime are very consistent from day to day, feedings are “on time” about 90% of the time. Waketime and naps are more variable from day to day. Some days she hibernates, other days she seems able to be awake and alert more, so we rely on cues quite a bit for naps. Occasionally chaos ensues and every nap is off! But we are close to the schedule most of the time- I include that info to encourage anyone reading who sees these schedules and wonders what they are doing wrong on off days- I’ve been there! Bad naps and bad days happen, but they have gotten much less frequent. STTN the full 11 hours most nights, she would occasionally starting around 9 weeks but now she is eating more at each feeding and she has started making it through most of the time. Dreamfeed didn’t work for us (we gave it a good effort, but she woke earlier with the dreamfeed than without) and cluster stopped working around 8 weeks. wake time usually consists of baby in bouncy chair watching mom have her coffee. wake time consists of some sort of exercise for mom, either stroller ride or front carrier hike. wake time: bath then errands. Wake time: bouncy chair or playpen time. Mom makes dinner. 7pm – Nap or awake usually put in swing because tends to be fussy at this time. Have not done dreamfeeds as we are usually in bed early and up early so found dreamfeeds would actually make me lose some of my sleep. 3-4am – Feed (when baby wakes up) straight back to bed. Still trying to drop this feed.